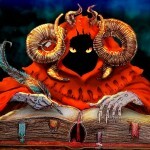 On a previous occasion I wrote about the different existing types of interactive fiction (gamebooks, visual novels or hypertext fiction among others) and the different thematic expectations of their readers, and I explained how hypertext fiction was more open to literary or thematic experimentation than other forms of interactive fiction. As an example of that, we have the work we are reviewing here, “Workers in Progress“, by Konstantinos Dimopoulos, better known as Gnome. In it, we take the role of the collective conscience of the greek working class, trying to organize their resistance and survive the complicated historical moment they are living. 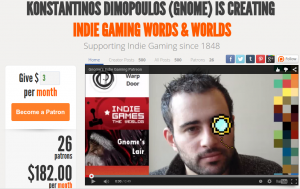 Konstantinos Dimopoulos is a well-known indie game blogger, and a programmer of games like this one. 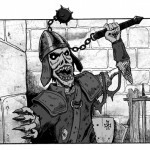 He has his own blog and writes in a good number of others, like Rock Paper Shotgun or IndieGames.com, and he also has a crowfunding project in Patreon where he can be helped to continue with his work as a writer and maker of indie games. With these credentials, it seems remarkable to notice the theme of this “Workers in Progress”, a highly politized story, trying to describe a situation as complex and difficult as the one that Greece lives nowadays. 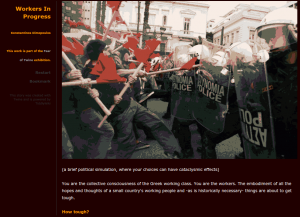 As we mentioned before, this “Workers in Progress” gives us the role not of a single character, but of a whole class; the Greek working class, subject to countless attacks in the name of its debt and “competitiveness”, in a historical moment in which the Greeks have finally realized that their leaders are not interested in their well-being. In this game, we have to take the appropiate decisions to escape this historical predicament in a collective manner. – In this work, Konstantinos defends exiting the European Union as the best possible way. I agree with him about that, but nevertheless some of his not so bad endings give the idea that Greece could survive the European Union with a progressive gobernment. Frankly, I don’t think so. For Greece, no matter how you look at it, staying in the EU would be a slow death, because of the conditions they will be imposed. In my humble opinion, exiting the Eurozone would be the only option they have left, in spite of the obvious problems. – I found it curious to see how, when betting on more progressist parties (Syriza) or even openly anticapitalist ones (Antarsya) we don’t achieve full socialism. But voting for more dubious options like KKE (the traditional communist party from Greece, of a noticeable Stalinist tendency) or even clearly negative ones like New Democracy (the conservative party of Greece, supportive of austerity) it is possible to reach much more possitive endings. Does Konstantinos want to give the idea that it’s necessary to fall in order to rise to a higher place? 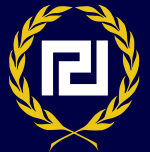 – The only option for the fascist party Golden Dawn to appear as an electoral option is if we haven’t suppressed the nationalist tendencies during the occupation of Syntagma square. I think it’s innocent to believe that only that would have defeated the far right. The presence of fascism in Greece these days is a result of many factors, like the support of the main Greek corporations, or the feeling of defeat of the population in general. The threat of fascism should be constant during the whole story. – I believe there is one important factor that this story barely considers; the fear of the population. Fear is what paralyzes the Greek people, and what institutions like the European Union or the International Monetary Fund, or the very Greek media, uses consciously to impede them to get organized and fight back. In any case, I think it’s a brave work, one that has dared to deal with difficult and current subjects. 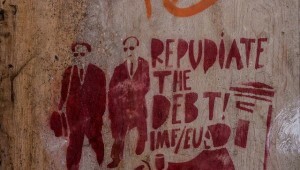 I believe the problem in Greece could happen in many other countries in the world, and that makes it a necessary story.